Scary Fact: In 2015, Canadians spent over $1 billion on Halloween-related purchases alone, or about $75 per person. It’s well known in the world of retail, that Halloween is the second largest shopping season after (or before) Christmas. What are we buying? The top three categories are costumes, decorations and candy. But it doesn’t have to be that way. 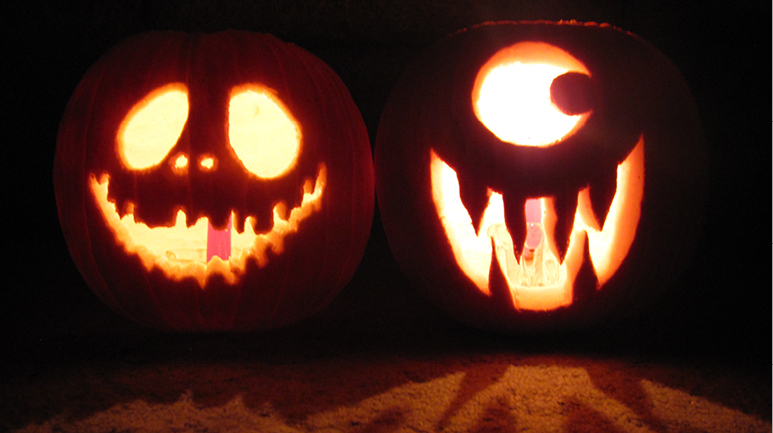 We can say “Boo” to overconsumption and excess waste while having barrels of Halloween fun. Here are six ways Green Action Centre suggests to enjoy earth-friendlier Halloween celebrations. Instead of trick or treating, have a neighbourhood party. It can be for kids or adults, or for people of all ages. Guests can come in costume. Food can be deliciously, seasonally frightful. Use your imagination to put a Halloween twist on party snacks – Witches Eyeballs (cherry tomatoes), Chocolate Slime (fondue), Ghoul Ears (dried apple pieces), and more. And why not go for Zero Waste by using re-usable dishes and cutlery, not disposable, and by recycling materials and composting leftovers. Keep the focus on fun, not candy treats, through games, activities, silly contests, healthy food, crafts, and music. Wearing something wild and playing ‘let’s pretend’ are a big part of Halloween fun for kids and adults, too. Make a costume from recycled and recovered materials. Or borrow one. Use your imagination and look around the house for items that can be incorporated into a unique costume. What can you find that could be worn by a funny clown, pirate, hippy, nerd, snowperson, or magician? Wear a box and be a birthday present, computer, piano or rubics cube. Find a friend and be a pair of dice. Visit thrift shops to find clothing and props. Check out more home-made costume ideas. If you are planning to use Halloween make-up, choose kid-safe and eco-friendly products that don’t have toxic ingredients that may be harmful to health. For safety reasons, most edible Halloween treats for kids are individually packaged, which produces a lot of waste. Plus all that sugar is not healthy for children. If you do decide to hand out treats at the door, consider useful, non-candy items such as pencils, erasers, seeds to plant, bookmarks, art and craft items, or simple treasures you make yourself. If it has to be something sweet, pick snack bars or other items that have nutritional value. Since Halloween is celebrated around the world, let’s make sure our global impact is a positive one in the type of candy we buy – more specifically, in regards to palm oil. If you are not able to find candy without modified palm oil, then fill your candy bowl with products made by companies that are members of the Roundtable on Sustainable Palm Oil. By buying candy from responsible companies, you are making a difference for wild orangutans and other endangered species that can continue to have a home in a forest past Halloween. This can be a really great way for older kids to dress in costume and participate in Halloween fun. The idea of reverse trick-or-treating is that instead of collecting candy and treats, participants hand out samples of Fair Trade products such as chocolate, along with a short explanation about fair trade practices. More information about fair trade is available on the Fair Trade Manitoba web site. Intact pumpkins make great pies, muffins and desserts. If your worried about toxins from that tea light, opt for a natural based candle such as bees wax or soy. 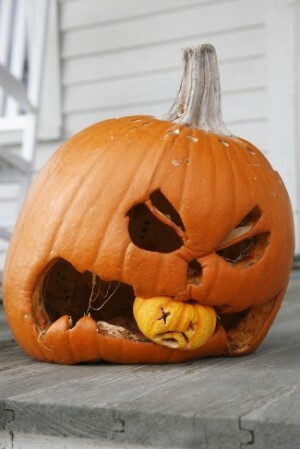 Jack-o-lanterns can also be composted after Halloween. Just chop them up and put the pieces into your backyard composter. Don’t forget that you can roast and eat pumpkin seeds or put them out for the birds in the winter. Or, if your dog is weird like mine, you can use it as a dog toy. More information here. For lots of creative tips for more earth-friendly Halloween celebrations, check out the Green Halloween web site. 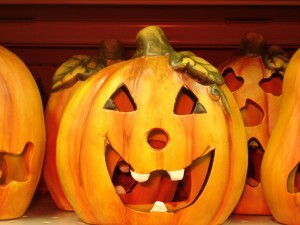 What are your thoughts and experiences in reducing Halloween waste? Please send us a note to share your ideas.